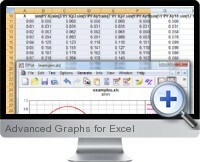 Advanced Graphs for Excel (DPlot) is a comprehensive application with an Excel add-in specifically designed for creation advanced data analysis and visualization graphs and charts. The advanced graphs are ideal for analyzing manufacturing and engineering processes but can be equally applied to any type of data analysis such as technical writing, digital recording, mathematics teaching, software development, soil engineering and geology, and hydraulic engineering. Advanced Graphs for Excel can produce presentation quality graphs from Excel data quickly, including many graph types not available in Excel such as polar charts, triangle plots, Mercator projections, grain size distributions and many more. Works with all versions of Excel from 95 and above. Creates professional presentation quality advanced graphs. Creates contour plots of 3 and 4-D data. Can use multiple selections if data columns are not adjacent or data is arranged as expected. Data is passed as floating point numbers internally is independent of the formatting. Blank cells are interpreted correctly instead of assuming zero values. Bar chart - Creates a bar chart with non-numeric labels on the X axis and 1 or more groups of amplitudes. One Curve Per Row - Similar to XYXY, but data is arranged by rows rather than columns, with alternating X and Y values in adjacent columns. Each row is used to produce one curve. XYZ Surface - Select an X, a Y, and a Z column (one or more selections) to produce a 3D surface plot. Z Scatter Table - Similar to Z Grid but produces a scatter plot rather than a surface plot. One D - Select one or more columns of amplitudes and produce a box-and-whisker plot.